Watching Vishal Bhardwaj’s latest film Haider is a visceral and haunting experience, as the gorgeous detail of the film allows every emotion and each drop of blood to be shown in crystal clarity. The story of treachery in Denmark is transplanted to Kashmir at the height of increased militancy in the area in 1995, but still remains tragedy on a grand scale. Bhardwaj and his co-writer Basharat Peer have successfully adapted the bard’s play into more modern-day India, although the pacing is a little inconsistent in places and at times the Kashmiri issue threatens to overshadow the personal drama. The heart of the film is in the performances, and although Shahid Kapoor is excellent in probably one of the best performances of his career, the real stand-out is Tabu who is completely mesmerising in her role as a conflicted mother to Haider and disloyal wife to Dr Hilal Meer. It is compelling cinema and definitely well worth watching in the theatre to fully appreciate the stunning cinematography and spectacular beauty of Kashmir. 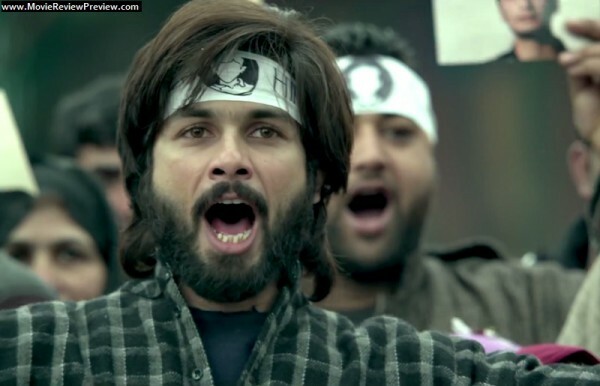 Haider (Shahid Kapoor) is a student, safely studying poetry in Anantnag when he learns that his father has disappeared after providing medical aid to a militant leader. Dr Hilal Meer (Narendra Jha) is taken by the army in a truly frightening scene that manages to grasp the sense of hopelessness and terror of a military raid in just a few moments. The grim method of selecting who may go and who is arrested by a balaclava-wearing man in a Jeep is chilling, as is the resignation that makes everyone line up for inspection without any word of complaint. The detail in each frame is incredible, and the performances are very natural, making the film seem almost like a news report direct from the action, rather than a fictional story. Dr Meer’s family home is also bombed, along with the militant leader still inside, and in a few seconds his wife Ghazala (Tabu) has become a ‘half-widow’ without anywhere to live. 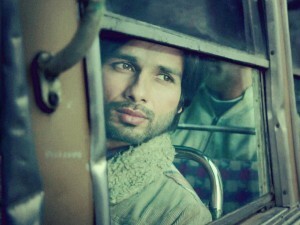 As a result, when Haider returns he finds his mother living with his uncle Khurram (Kay Kay Menon), and he is instantly suspicious about their relationship. While rejecting his mother, Haider relies heavily on his girlfriend journalist Arshia (Ahraddha Kapoor) and two friends Salman (Sumit Kaul) and Salman (Rajat Bhagat) as he searches for his father. Since up until this point the film is unrelentingly bleak, it’s a real relief when the comedy appears, and Salman and Salman are an excellent counterpoint to the violence and despair elsewhere. Haider’s search for his father is heart wrenchingly sad, as he is just another one of many who are searching for their own disappeared relatives. However, interspersed with his search are confrontations with his mother and uncle which fuel Haider’s anger and mistrust. The relationship between Haider and Ghazala is wonderfully nuanced and both actors capture the essence of Shakespeare’s characters and their conflicted emotions well. There is a frisson of sexual tension, heightened since Tabu looks way too young to be Shahid’s mother, but mainly the film focuses on Haider’s sense of betrayal when his mother takes up with his father’s killer. Kay Kay Menon is also effortlessly perfect, juggling Khurram’s political ambitions with his desire for Ghazala and bringing more depth to the Shakespearean character of Claudius than I seem to remember from studying the original play at school. The romance between Haider and Arshia is also nicely developed, and Arshia has a believable character as a journalist and relatively realistic relationships with her brother Liyaqat (Aamir Bashir) and father (Lalit Parimoo). Shraddha Kapoor is good in her role, particularly in her scenes with Shahid and she’s also credible in her despair when she loses the plot after her father dies. Most of the other characters from Shakespeare’s play appear, although the role of the ghost is changed into a fellow prisoner of Dr Meer who is expertly played by Irrfan Khan. Most impressive is the ‘play within a play’ which in is depicted as a song. The puppets are wonderful, but even just a glimpse of Tabu and Kay Kay Menon in this clip illustrates just how good they both are in conveying their characters. Haider’s eventual descent into madness is dealt with better than the earlier scenes where Shahid sometimes appears a little too distant. But as the film progresses his emotional shifts and internal struggles are mostly well represented and he does genuinely appear to be a conflicted personality by the end. Many of the famous lines from the original Hamlet appear in Haider’s soliloquies, although they are also inserted into various conversations (and the subtitles don’t really do them justice), and there is even a brief appearance of the skull before the final, and very bloody showdown. This is passion, vengeance, despair and madness writ large and the scope of the film truly feels epic. Haider impresses with fine attention to detail and excellent performances from the entire cast. However the shift to Kashmir means the military conflict looms large in the story and as a result the original tale of betrayal and treachery occasionally gets a little lost. The pacing is uneven, particularly in the first half, but this allows time for the complexity of the characters to fully develop so isn’t necessarily a flaw with the film. It is a bleak story and be warned that some scenes are definitely not for the squeamish as the body count piles up and cinematographer Pankaj Kumar illustrates just how well snow contrasts with blood. 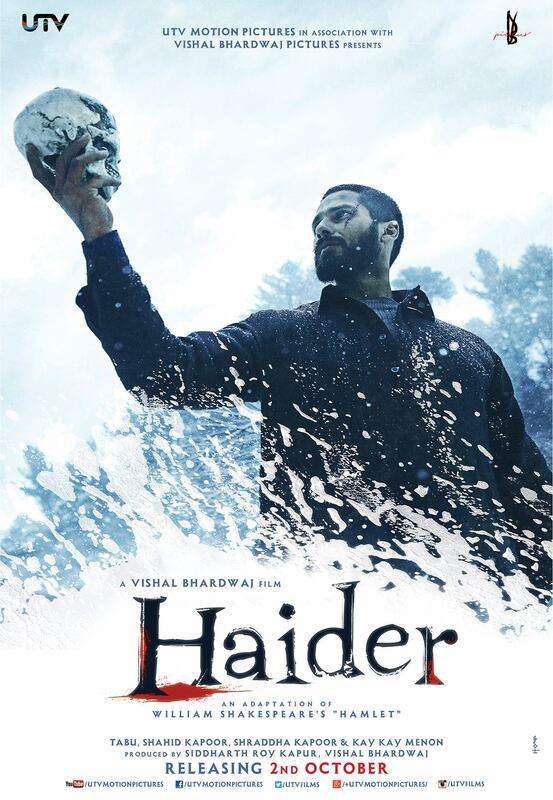 Overall Haider is a well crafted and novel interpretation of Shakespeare’s Hamlet and one I definitely recommend watching for excellent performances and a rather different view of Kashmir. This entry was posted in Bollywood and tagged Aamir Bashir, Ahraddha Kapoor, Basharat Peer, Haider, Hindi, Irrfan Khan, Kay Kay Menon, Lalit Parimoo, Narendra Jha, Pankaj Kumar, Rajat Bhagat, Shahid Kapoor, Sumit Kaul, Tabu, Vishal Bhardwaj. Bookmark the permalink. Thanks for your comment, and the link to your review. I think Bhardwaj is to be commended on making a film that can stand alone as a good film, as well as being an excellent interpretation of Hamlet. I think he captures the individual emotions and relationships incredibly well, Khurram’s desire for power and for Ghazala, Haider’s grief for the loss of his father and his conflict between the love he has for his mother and the absolute contempt he feels for her and her relationship with Khurram and over it all Ghazala and her own desires and emotions. As you mentioned in your review, I think his desire to completely adapt Shakespeare’s play caused some issues with the pacing, but it’s still an amazing achievement and a great film.